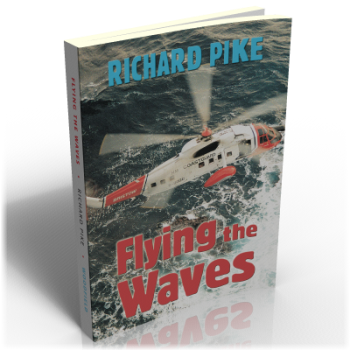 Following on from his highly praised autobiography The Spice of Flight, in which he described his 20-year career with the Royal Air Force as a jet fighter pilot in the early 1960s and later as a military helicopter pilot, this book continues Richard Pike’s flying memoirs. Much more than just a sterile account of flying activities, Richard’s latest book takes us on an evocative journey, spanning his lengthy career as a civilian helicopter pilot and taking in a wide variety of experiences – some tragic, some dramatic, some comic – but all observed with a keen eye for detail and recounted with wry wit in an entertaining style. After leaving the RAF, in 1981 Richard joined Bristow Helicopters in Aberdeen, re-training to fly the US-built Sikorsky S61 – the workhorse of the North Sea – an aircraft he was to fly as pilot and co-pilot, for the next 18 years. Much of his work involved routine ferry trips to and from the North Sea oil platforms, although changeable and often dangerous weather conditions ensured few dull moments for a pilot. There were also times of high drama, the most significant being the Piper Alpha disaster in 1988. Amongst Richard’s other recollections are a number of eventful search and rescue operations whilst working for the Coastguard in the Shetlands and Outer Hebrides, a three-month working trip to the Falkland Islands in 1986 which afforded the opportunity to see where his cousin Hew Pike had commanded ‘3 Para’ during the Falklands War, and a voluntary trip to the Balkans, flying a United Nations S61, delivering humanitarian aid to the citizens of Kosovo.